In the last weeks, I added many new fractalists and artists to my devwatch list; along with that, I realized I never featured some of my friends who really deserve it. Here's the first (of many, I hope! ) article featuring my new (and old) friends and their incredible artworks. And don't forget to this article to spread the word! Thank you very much for Featuring my artwork here..........This is a first for me!! Some great Artwork here... Thank you again. Thanks a lot for this super feature and for including me too!!! What a great feature, added to my watch list! Thanks for including me. I am honored. What a marvellous collection! (Lots of pieces to fave ... ) Thank you! Anna, I'm very honored that you included me in this awesome collection of artist! Thank you!!! It's a pleasure to be among these wonderful artists and discover so many beautiful works! Thank you for featuring my art. Thank You for the Feature and for being included as your friend! Sure you are, and you're welcome! Wonderful collection and thank You!!! Thank you for including me. It is such an honor. I only wish I could see the thumbs. Only the avatars are showing. This is happening in all journals. Not to me, I see everything! Life's going on, I'm better now, and I feel I have to feature some artists I recently added to my watchlist and to my faves; some of them are incredibly underfaved. Again, mostly Sherlock - but not only. FFF series issue 13You wonder what's with the weird title? Yep, I thought I should submit with sta.sh instead of my journal, and of course, it was the famous 30 character limit again. Nevermind, I've heard that it will change soon. I'm back again with the series. And from now on, the series will come out semimonthly instead of each week. It gives me more time to dig up new goodies and collect resources and news. And you'll not be tired of the squirrel and her instant chattering. At least I hope so The fractal artists here never disappoint, it's a constant stream of lovely beauties into the fractal gallery. Let us dive into them, shall we? Ralph hails from the UK and has very recently started using his account on a regular basis. He is busy re inventing the MBD wheel. His eye for detail allows hime to render at a point when most of us would be zooming and adjusting to get those fine details bigger and thicker and - totally different! Mandelbulb 3D at DeviantArt and Thanks!Like so many I have become fascinated with Mandelbulb 3D. I use other fractal programs but put most of my time into exploring Mandelbulb 3D. I have to thank a lot of people who have supported my work and given a helping hand with Mandelbulb 3D. However a special thanks goes to Hal Tenny who with his awesome art and tutorials has gotten a lot of artist into Mandelbulb 3D. Here is a small sampling of some of my favorite Mandelbulbs found on DeviantArt. and fantastic contributors, including Daily Deviations they may have received too. Digitized: May 2013Digitized is a monthly feature of several awesome deviations from the Digital Art category of deviantART's gallery! Let's get started! on a daily basis we at DailyFractalFeatures are aiming to showcase a small selection of fractal artwork to the community. 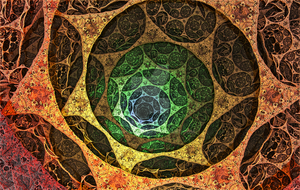 We are proud to feature today's Daily Fractal Feature! Please comment and the works featured and congratulate the artists! Apophysis Challenge #135Welcome to a new week of fractal fun! The runner up for last week's challenge is snupi988. Congratulations on the win Epogh! A feature: my new (and old) friends ::1::In the last weeks, I added many new fractalists and artists to my devwatch list; along with that, I realized I never featured some of my friends who really deserve it.